Told this story to Mike Finley from IHOP Kansas City, as he visited ORU. 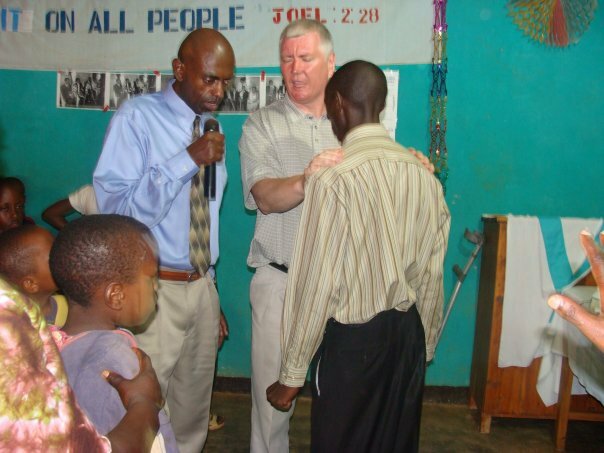 Mark 8:22 ¶ And he cometh to Bethsaida; and they bring a blind man unto him, and besought him to touch him. There are things that happen in real life, when you minister under the anointing of God that are not simple, cut and dry, principals that we can build black and white doctrine on. There is a flow of the Holy Spirit, where He leads, and we follow. I love this portion of Scripture, because I see the humanity of Jesus, God the Son, operating as many, like us, totally helpless, without the power of God operating in his life. The man replied “I see men as trees walking”. Jesus did not give up, or puff up, he simply laid his hands on the man again, for another impartation of the Holy Spirits anointing, and the the man was totally healed. 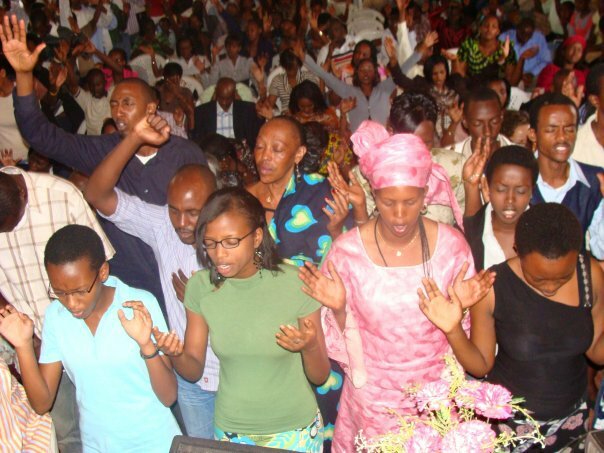 While in Rwanda in 2009, on a missions trip hosted by Parfait and Michelle Karakezi, we did an evangelistic outreach for pastor Josephine Ngabirano. It poured rain, and we jammed into a small building while the thunder, lightening roared and flashed, and water came out of the sky in buckets! While preaching, the Lord spoke clearly to me that he wanted to heal someone’s leg. I kept repeating it, the burden so deep, the command of the Lord so clear. It was getting embarrassing, as I stood there with the microphone pleading that someone come forward so that I could pray for their leg. Finally, in out of the storm, came a homeless man, crippled in one leg, with a tree branch he was using as a crutch. He had come in out of the storm and he was soaking wet, and his leg was a sight to behold. He had been born with a birth defect, whereby his leg was corkscrewed so that his foot was turned backwards, pointing behind him. When I saw him, I felt any faith I had, leave. This was going to take a miracle, and only Jesus could do it. 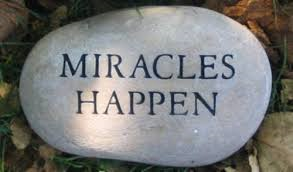 I asked the children if they had ever seen a miracle? Their eyes got big, and they shook their heads. So, I sat him down on a chair in front of the meeting, and had the children from the choit all come forward and stretch out their hands to pray. In that sweaty little room, I had the children repeat: Father (Father), please heal his leg (please heal his leg), Now (Now), in Jesus name! I’m missing a bracket, because the translator had them say it in Kinyarwandan. While I was holding the man’s foot, it began to move! Through hot tears, I saw God unscrew the man’s leg, right in front of us all! His foot was now pointing forward, but his leg was at least 6″ shorter than the other. So, I explained to the children, that even Jesus had to pray for the blind guy twice, and I’m not that good, so let’s pray again! As we prayed, his leg grew out at least an inch, before our eyes! 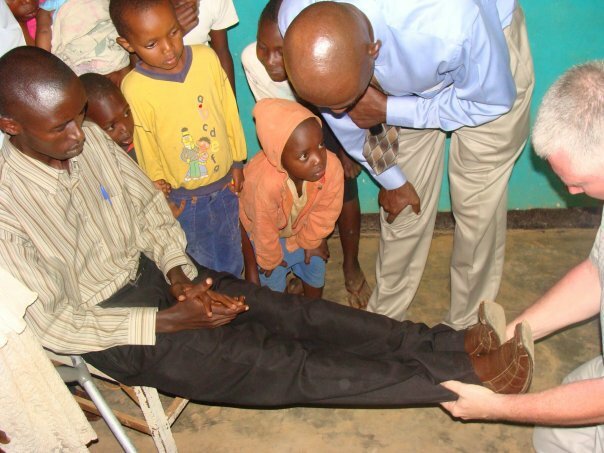 We prayed this prayer several times, until the man’s leg was full length. Inch by inch we watched it grow, each time we prayed! Finally, the man was able to stand, without his crutch! As the man and I began to walk together, it was clear that his leg was weak from lack of use, so I realized he needed daily exercise. I asked the crowd, is there anyone here that will walk with this man, every day? I learned later, that this great man was the mayor of the town, and he truly did walk with this man until he was strong, then helped him get a job so he could provide for himself. Such great honor! Don’t know about you, but I have had to pray for people several times, and as I worked among the mentally and physically handicapped, daily, for years. Sometimes, miracles were instant, sometimes, the best I could do was rejoice that the presence of God manifested, and that the person received some degree of comfort from the Holy Spirit as I prayed.1 Cor 12:7 But the manifestation of the Spirit is given to every man to profit withal. 31 But covet earnestly the best gifts: and yet shew I unto you a more excellent way.How I love to move in the gifts of the Holy Spirit, and I seek Him, His presence, and His gifts, daily, to meet the needs of hurting humanity, but how well I have learned, that He is Lord, and I am not. These gifts, are exactly that, gifts, given: AS HE WILLS! I am the servant, He is the master. Yet, I have discovered, He is a lot more willing than people give Him credit for. He loves to be sought, in passion and fire, your frustration and pain the very gateway to your miracle, if you would cry out to God. Do not let the two greatest thieves: yesterday and tomorrow rob you of your miracle! His name is I AM! NOW faith is. Today is the day of salvation. Refuse to be denied, or accept the lie that you need to wait on God’s timing, that He is working things together for your good, while you wait. If you are sick, handicapped, or afflicted, time is not your friend. Each day is more pain. Time is like a parade, that God can see from the beginning to the end, as He reigns above it all. He is willing to enter time, the moment faith cries out, and He is still a God of suddenlies. One touch of His power, changes it all. Today! Seize the day, and demand action from heaven and hell. Get in the face of God, boldly. Your pain has been bold, your sickness insidiously slinking inside of you, sucking your life, strength, and working on your will to fight, to live. Say NO to this devilish deception! Cry out! He is Almighty, TODAY! 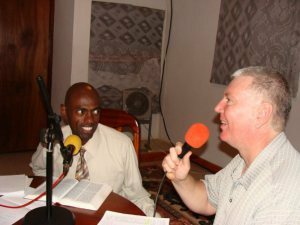 Eternity?Share the Gospel On-line – GO!